Choose your background color, font, and message. 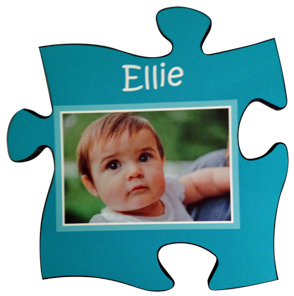 Giant Puzzle Piece Plaque is 12" x 12" x .625" medium density fiberboard (MDF). Ready to hang on wall with drilled key hole. These unique wood plaques make excellent wall art for you home, office, school, day care center, or a great gift for grandma and grandpa, aunts, uncles, sponsors and friends. Give a unique wedding present. Use one plaque for the bride and one plaque for the groom and display them fitted together. Track you child's progress with a plaque for each year. Have a special message you whisper to your child each night before they go to bed? We can print the message on a plaque for your child's room. Enter the number of plaques you would like with this image.